Be sure to catch a glimpse of our students’ beautiful kaleidoscopes project on the District’s website. Mrs. Letourneau, our Art Teacher, has been working with students on a cross-curricular project to use scientific information about the refraction and reflection of light. Students have experimented with a wide variety of materials to make mirrors, or reflective surfaces, which serve as the core of their kaleidoscopes. 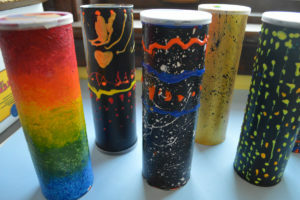 The kaleidoscopes are fashioned from empty Pringles canisters, decorated by the students. Many different objects and materials were available to the students to use in the building of their kaleidoscopes. The results are both beautiful and inspiring. Students have tracked the progress of their project work in their scientific journals. All of our students in K-5 will be involved in this Science, Technology, Engineering, Art, and Math project! Mrs. Letourneau is a member of Genet’s School Achievement Team, which has led the path for MakerSpaces at our school. We hope you enjoy gazing into your child’s kaleidoscope when it comes home! Thank you, Mr. Letourneau! Spring is supposed to be here!